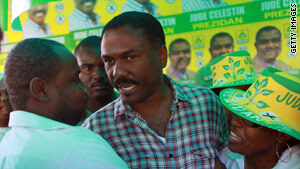 Presidential candidate Jude Celestin campaigns last week in St. Marc, Haiti. Port-au-Prince, Haiti (CNN) -- The convoy of a leading Haitian presidential candidate came under attack from gunmen, the candidate's sister said Tuesday. "We just cannot believe it. It's unbelievable. We're still in shock," said Rita Celestin-Rancy, a sister of Jude Celestin, who was traveling with her brother's 20-vehicle convoy to the southern city of Jeremie when they came under fire near Beaumont. Celestin-Rancy said one person was killed and another wounded. Police did not return calls from CNN. Campaign manager Joseph Flambert called into Haiti's Radio Caraibes to say the convoy retreated after a "hail of bullets." Celestin, a director of Haiti's road construction department, is the endorsed candidate of outgoing Haitian President Rene Preval. Celestin is one of 19 Haitians vying for the nation's top office. Celestin-Rancy declined to speculate on whether Monday night's attack was politically motivated. She said her brother's campaign was awaiting the results of a police investigation. Candidates have been ramping up their campaigns in the final days before the vote. The streets of the Haitian capital throbbed Monday with music emanating from mobile speakers carrying messages of support for some of the 19 presidential candidates. Tensions exploded as well in the western coastal town of Miragoane, where resident Antony Gae told CNN on Monday that police fired guns to disperse demonstrators who were burning tires and accusing Haiti's main electoral commission of bias. But planning for Sunday's scheduled presidential election and legislative elections is moving forward, U.S. Ambassador to Haiti Kenneth Merten told reporters Tuesday from Port-au-Prince. "While much remains to be done this week, the process is on track: 250,000 new voters were registered and more than 11,000 voting stations have been identified," Merten said. The Haitian Conseil Electoral Provisoire, or CEP, is overseeing the plans to ensure "free, fair, and transparent" elections, he said. The Haitian National Police is in charge of Election Day security, with support from the U.N. stabilization mission in Haiti, known by its French acronym, MINUSTAH. A number of observers are in Haiti, including the Joint Electoral Observation Mission, an effort of the Organization of American States and the Caribbean Community of Nations. The mission is expected to have more than 100 observers deployed across the country as monitors, he said. Another 5,000 to 7,000 electoral observers belonging to Haitian civil society groups will be "keeping an eye on things," Merten said. He noted that the Haitian government has said there is no public health reason for the elections not to take place. "I see them as two separate issues," Merten said. "We have a cholera problem here, which is something that the Haitians and we are all grappling with, which is a major public health challenge here. And we have the elections which should take place, need to take place, and we are here to support that effort." Cholera has killed at least 1,415 people and sickened more than 60,000, the Haitian government said Tuesday.